What is a Razor Comb? Some of you may never even have heard of a razor comb; however, this super-useful and unique item is for real! There’s no complexity behind it, and it is exactly what its name suggests – a comb with an inbuilt razor blade. A razor comb is a comb that has a razor blade attached to it, allowing you to effortlessly style your hair any way you want. Keeping your hair well-groomed always can be tough, and biweekly salon visits can cost you a bomb. You may especially hate it if you’re lazy. So, is there any solution? Well yes, you guessed it right! It’s the razor comb. Why Use A Razor Comb? With the help of this comb, you can style your hair effortlessly whenever you want, within the comforts of your home. Needless to mention that office-goers need the razor comb more than anyone since they must maintain their professionalism by keeping their hair in order always! This could be great, if our hairs were always the same or instead, the way we want them to be without our efforts. The constant need of cutting our hair is not always pleasant. If for women it is possible to have their locks untouched by scissors for quite a long time, for men this is not always suitable. For the majority of men, especially for those, whose work includes a certain level of officialism, cutting their hair regularly is a norm of life. Yet, visiting a hairdresser twice a month can be quite expensive for some people, but the need to have the growth on their heads in order is still acute. In such cases, it may be reasonable to consider using a special razor comb, which will allow cutting and trimming one’s hair without going anywhere. How Do You Use A Razor Comb? Get an appropriate haircut: It becomes difficult to use a razor comb if your hair is too thin or too short as then it could lead to cuts on your scalp. It is ideal to get a stylist who would give you a hairstyle that would be razor-comb friendly. Ask him/her to give you a hairstyle that would look for textured so that it becomes easy for you to maintain it at home. If you have bobs, layered, shags, curly texture or long hair, a razor comb would be best for you. Use a spray water bottle: Get an empty spray bottle and fill it with water. Use the same to wet your hair fully. Wet hair makes your hair look longer and fuller. Ensure your hair is wet before you start using the razor comb. You get a better cut when your hair is wet and not dry or brittle. Don’t forget to untangle your hair and remove all knots before using the comb! Master the method: Start by taking a section of your hair that should be at least 1-inch wide and use a regular comb to comb your hair to remove all tangles and knots. Now take the razor comb and place it against the part that you want to chop, texturize or make thinner and don’t forget to hold the razor comb at a 45-degree angle. Remember that you should never start from your roots as that could lead to bald spots on your head. You wouldn’t want that obviously! Remember to take short strokes quickly using light pressure while you use the razor comb. If your aim is to thin or texturize the hair, work your way from starting point to the tip of the hair using the comb. If the agenda is to cut hair length, keep stroking the comb over the part where you want to cut the hair off. Keep doing it until the hair is chopped away. Now go back to square one and do the same for the next 1-inch section and repeat for the entire head! Once that’s done, style your hair as per your liking. Here’s a list of the most amazing razor combs available in the market. Grab them as per your liking to see the best results. Read on. To get rid of tangles, it has a built-in comb. It is equipped with extra blades. This 45.4 g razor comb is perfect for light, short, medium and extra short haircuts. It comes with double-edged razor blades of regular size. The appliance is portable and very easy to use and handle at home. The blades can be changed as they are detachable. The razor is well-shielded so as to not lead to cuts. The blade is high-quality stainless steel which makes the product durable. Helps you trim your hair just like a professional. It offers a firm grip and can be held easily. It can give you an edgy look by shortening, shaping, layering, and thinning the hair. Available in colors including purple, green, black, blue and red. Made of plastic and metal and measures 7.5”x1.2”x0.3” (Length x Width x Thickness). 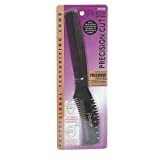 Razor combs help you to trim your split ends and add texture to your hair. Investing on a razor comb would be worth it, and it will go on to save you a huge amount of money that you would otherwise spend for regular salon haircuts. There is no mechanism in it; there is just a comb with an attached razor blade. This is such a great decision for everyone, who does not want to go to a salon every two weeks in order to take off the excessive bulk or to trim one’s bangs. A razor comb is not expensive, and the easiness of usage can be another reason for having it at home. It will allow you to trim the split ends, to add texture to the mass of your locks and to save time and money. However, it is thought that the best results can be achieved at curly and coarse locks, and if your mane is getting thinner or if it is fine by its nature, then you should better be careful with the razor comb in order to avoid cutting too much off the already not that numerous curls. What you need to use a razor comb is a head with hair, a pair of firm hands and namely, the razor comb. You may moisten your locks with water, use the razor comb right after a shower, or whenever you want, but you need to keep in mind the fact that the result will be better if you cut the damp strands. Another thing to remember is that when your head gets dry the hair tends to seem shorter than when it is damp, so don’t try to cut too much at a time. It is always better to do in small sections, which will, in the end, look much better than if you manage to snap off a too bulky lock. Again, having the razor comb at home, you will be able to renew your hairstyle at any suitable moment, and there is no need to cut it as short as possible and then be forced to wait until it gets longer and you will be able to look normal again. When razor-combing your hair, never use the downward motions. This way you will chop off too thick pieces, and this will look not neat. Move the comb slantwise, carefully take off the bulk and add the texture to your crest. Finally, you’ll have enough skill and the procedure will seem a pleasure for you! hell I have nice met to you !!. good to see you . this my name is Manuel he say that about what to thing I would like say that those you are get how for properly I need get again cut my hair just little short for straight and so much better. myself can see my hair not balance and equal too both front head and back head a mess hair what up if see check up my pleasure more information black professional person ability pro good customer !!.. so maybe I need to go anywhere at place salon barber if see what I doing it. hello this my name is Manuel I want to know get how professional who black person a ability does if see make sure my pleasure salon barber anywhere at place I need you know I need cut my hair just least short if see check up it. save my money .